Tanner asked me to send ‘get well’ wishes to his friend and running buddy (literally) Porter. Robby & John Mazza adopted Porter, whose first home was the South L.A. County Shelter. The poor pup had suffered a broken leg, which his first foster owner had repaired. At that time, they used a metal plate and screws to help it heal. It left him with a slight limp but he was still really active. Lately, though, when the leg began giving him problems, Robby and John turned to the Malibu Coast Animal Hospital for help. After inspecting the big boy, they put him under and removed the plate. 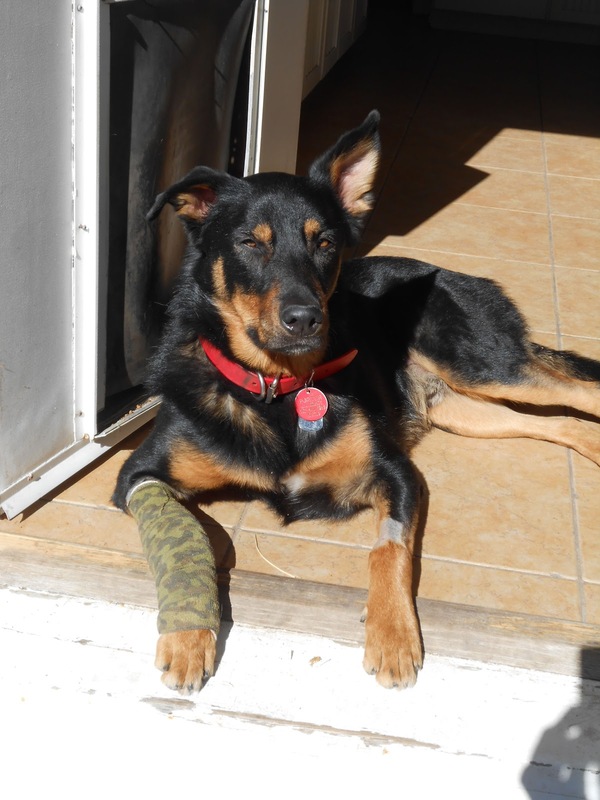 Porter made it through with flying colors and is now resting at home, sporting a very cool Rambo camp bandage. He’s on restricted duty for a while but should be back to his super self very soon. German Shepherds, Malibu Coast Animal Hospital, rescue dogs, shelter dogs, South L.A.